Popular televangelist Benny Hinn, who late last month announced that he was reconciling with former wife Suzanne Hinn, has revealed that the divorce came about due to her struggle with an addiction to prescription pills. "Suzanne started taking certain prescription medications to help her cope with some of her personal struggles. She became dependent on those for nearly 15 years, and those medications made her behave erratically at times," Hinn wrote in a message on his ministry website. "As her husband, I did not know the extent of her reliance on these medications, nor did I fully understand just how much harm they were causing to her, physically and emotionally,"
Suzanne Hinn filed for divorce from the popular preacher in Feb. 2010, with court documents citing irreconcilable differences as a reason. Hinn, a popular prosperity preacher who travels the world performing faith healings, had previously suggested that it was his time away from his family that had caused marital problems. While he reinstated these suspicions in his latest message, and even suggested they played a part in his wife turning to medication, he also revealed details about the divorce that were not previously known. "The truth of the matter is that Suzanne filed for divorce because she was in a deep emotional and physical crisis that affected her in such a way that caused her to make a decision she now regrets. And although it was, without question, the most agonizing two and a half years of my life, the end of our marriage most certainly woke me up, and the Lord used it to show me -- as a man of God and as a man -- that I cannot function properly without my wife and family," Hinn explained. Despite these past hardships, Hinn affirmed that the love he shares with his wife is now stronger than ever. "The covenant we made with God more than 30 years ago was never broken in His sight. Both of us believe our greatest days are ahead and the best is yet to come! Sue and I have submitted to godly counsel and oversight to ensure our past mistakes will not be repeated, and we will continue to do so," the minister continued in his message, and stressed his resolve to make the marriage last a lifetime. Hinn also revealed that he and Suzanne were planning to open a home for couples who are struggling in their marriages, but noted that he would go into details about those plans at a later time. 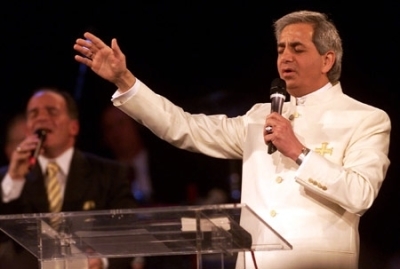 Benny Hinn Ministries and Hinn's World Healing Center Church are located in Grapevine, Texas. Bishop Eddie Long to Join List of Other High-Profile Megachurch Divorces?